Full schedule of events awaits Rooster Walk 3 patrons on Memorial Day weekend! MARTINSVILLE, VA. – A lights-laden performance from Grammy-nominated headliners the Infamous Stringdusters, two long sets from festival hosts Folk Soul Revival and a packed list of events at the workshop stage: These are just some highlights from the Rooster Walk 3 schedule recently released by event organizers. 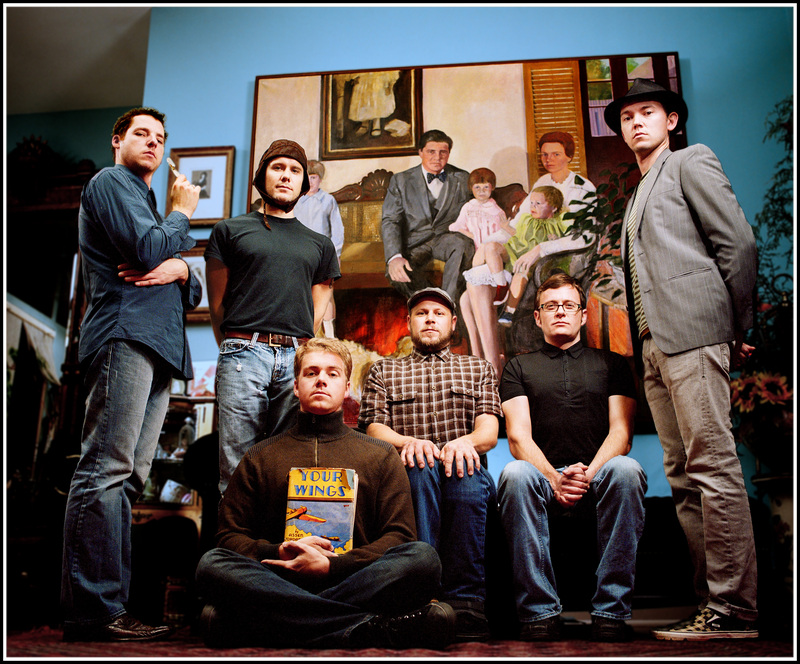 The Infamous Stringdusters, a progressive bluegrass band from Nashville, Tenn., will perform from 8:40-10:10 p.m. on the Creekside Stage at Blue Mountain Festival Grounds on Saturday, May 28. The band, which tours throughout the country and abroad, will be making its first trip to Rooster Walk. The Infamous Stringdusters will headline Rooster Walk 3 on May 27-28 at Blue Mountain Festival Grounds near Martinsville, Va. Members of this Grammy-nominated band are (on floor): Travis Book, (on couch, from left) Jesse Cobb, Jeremy Garrett, (standing, from left) Andy Falco, Andy Hall and Chris Pandolfi. 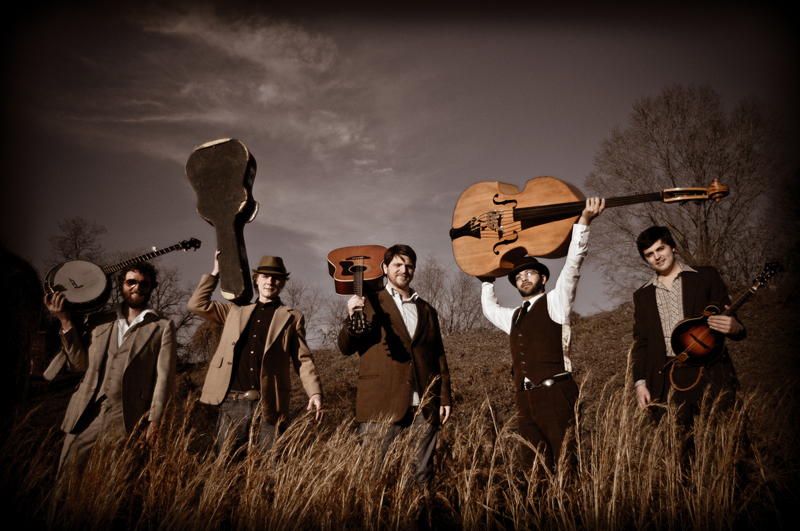 Roots-rockers Folk Soul Revival are the only band scheduled to perform during both nights of the festival. The group, which formed in Wise just three years ago, will play on the Blue Mountain/Bassett Furniture Stage from 10:25 p.m.-midnight on Friday, May 27. 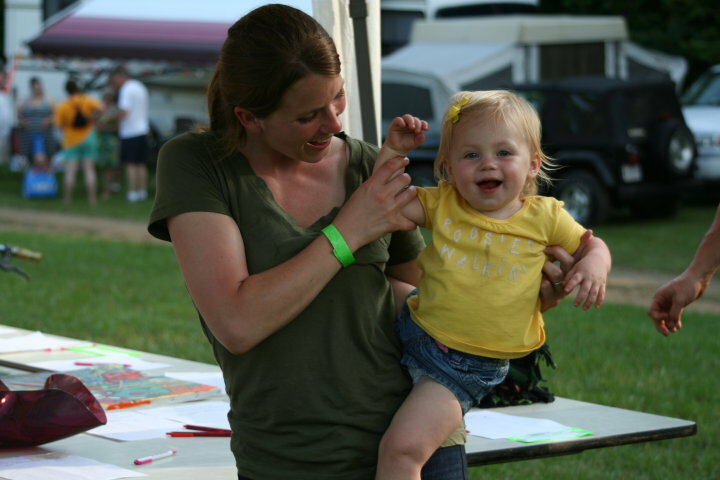 FSR will play one night later on the Creekside Stage from 5:30-6:50 p.m.
Joanne Lane (left) and daughter Hunter Lane pause for a picture during Rooster Walk 2 on Memorial Day weekend, 2009. Another new addition to the festival is the Arts at the Rives Theatre (ART) Workshop Stage, a smaller, temporary structure that will play host to nine activities on Saturday, May 28, ranging from children’s programs (painting, guided creek walk, drum circle) to yoga, songwriting and guitar workshops. Festival gates will officially open at noon May 27, with the Blacksburg-based kids rock band Levi’s Gene Pool getting things started at 4 p.m.
Mainstreet Moonshine, a band of Hampden Sydney College students that features Martinsville native Riggs Roberson on guitar, will play at 4:50, followed by the Stuart-based band Poverty Level at 5:50 and Relacksachian, of Roanoke, at 6:55. Festival favorites Sanctum Sully will hit the Blue Mountain/Bassett stage at 8 p.m., followed by Charlottesville pop-troubadour Travis Elliott, Folk Soul Revival and jamband stalwarts the Kings of Belmont. Gates will open at 8 a.m., on May 28, and the Pan United Youth Movement Steel Drum Orchestra will start the day’s music. The Martinsville Community Jazz Ensemble will perform at 11:35 a.m., followed by the Australian-born singer/songwriter Mariana Bell. Bluegrass behemoths Big Fat Gap will fire up at 1:45, and the soulful vocals of the Lizzy Ross Band will start soaring at 2:55. Charlottesville rockers Rob Cheatham & GUNCHUX! Will play at 4:05. Folk Soul Revival will then perform on the Creekside Stage, followed by reggae-rocker Jesse Chong on the Blue Mountain/Bassett stage. The Infamous Stringdusters will get going at 8:40, as Berkeley Dent of 81 Productions cranks up a full-fledged lights show. Guitar wizard Jamal Millner, of Jamal Millner and Comrades, will begin at 10:20 before giving way to The Mantras, a popular jamband from Greensboro, N.C., who will close out the festival. A mother and daughter dance at Rooster Walk 2 on Memorial Day weekend, 2009. Proceeds from Rooster Walk go to the Penn-Shank Memorial Scholarship Fund at Martinsville High School. The fund, like the festival itself, is named in memory of late Martinsville natives Edwin “the Rooster” Penn and Walker Shank. In just two years, festival organizers have donated $10,000 to the merit-based scholarship fund. This year’s scholarship winner will be chosen from the current senior class at Martinsville High School. He or she will then be honored during the festival on May 28. Tickets are currently $40 for a general admission weekend pass ($105 for VIP), and camping is $20 per vehicle with no limit to the number of occupants per vehicle. Tickets are available in the Martinsville area at the Southern Virginia Artisan Center uptown, Woodall’s Music in Collinsville and Binding Time Cafe in the Druid Hills shopping plaza. Ticket prices will increase to $50/G.A., and $125/VIP at the gate on festival weekend. For more information, visit www.roosterwalk.com. For a detailed band schedule, head to the festival blog at www.roosterwalk.wordpress.com. Join Allison Wilkie, the yoga instructor and fitness director of Chatmoss Country Club, as she leads you through a stretch of exercises that will get you ready for another awesome day of festival goodness. “Honey bee, where are you?” is a serious question being asked around the world today. Honey bees are extremely important, but they are becoming extinct! Join Patrick County author Martha Scott as she reads her rhyming children’s book that explores life inside a honey bee colony. The book also gives ideas about how people of all ages can help these tiny, fuzzy insects continue their fight for survival. Jonathon Blake has been a fixture at Rooster Walk since Day 1, painting live performance art as the bands perform. Blake’s reputation as a performance painter is well established along the East Coast, and now he’s going to share some of his tips with kids at the festival. The result of the workshop will be a group-made painting. We’ve brought together two accomplished young songwriters to discuss their craft. Travis Elliott (Charlottesville, Va.) has written about subjects ranging from love to spaceships on the way to a song catalog of more than 500. Lizzy Ross’ work has been drawing critical acclaim since she hit the scene in Chapel Hill, N.C. roughly three years ago. Put on your water shoes and join Robin Jensen of the Virginia Museum of Natural History as leads a guided walk along – and into – beautiful Snow Creek. Children will learn about macroinvertebrates and aquatic ecosystems as well as the importance of protecting their environment. Two guitar masters from different disciplines will combine forces for a very special guitar workshop. Jamal Millner brings a jazz background and classical training, while John Garris has been playing bluegrass since he was old enough to hold the guitar. Both are incredible musicians. Follow our group leader step-by-step as you tie dye your own Tshirt! Buy a Rooster Walk shirt from the Merchandise Tent or bring your own. Fun for the whole family. Bring your budding musician for the chance to play on bongo drums of various shapes and sizes. Led by Martinsville native Jeff Sharp, kids will try their hand at keeping a beat and making some music for all to enjoy. Once, there was a band. A band so skilled that their every song was a perfect soundtrack to the incredibly popular duck race at Rooster Walk. … Though Joe Washrag has disbanded, their spirit lives on in the form of tiny plastic birds floating down Snow Creek, with great prizes awaiting the quickest finishers. The Infamous Stringdusters, a 2011 Grammy-nominated progressive bluegrass band, will headline the third-annual Rooster Walk Music and Arts Festival on Memorial Day weekend near Martinsville, Va.
A six-piece outfit from Nashville, Tenn., the Stringdusters received a Grammy nomination in the Best Country Instrumental Performance category for their song, “Magic #9.” The band will perform at Rooster Walk 3 on Saturday, May 28 at Blue Mountain Festival Grounds. The Stringdusters achieved almost instant stardom. In 2007, while touring in promotion of their debut album, “Fork in the Road,” they won three awards at the prestigious International Bluegrass Music Association awards ceremony: Emerging Artist of the Year; Album of the Year; and Song of the Year. The ‘Dusters just finished a two-day performance at Merlefest over the weekend, where they were once again main-stage performers. 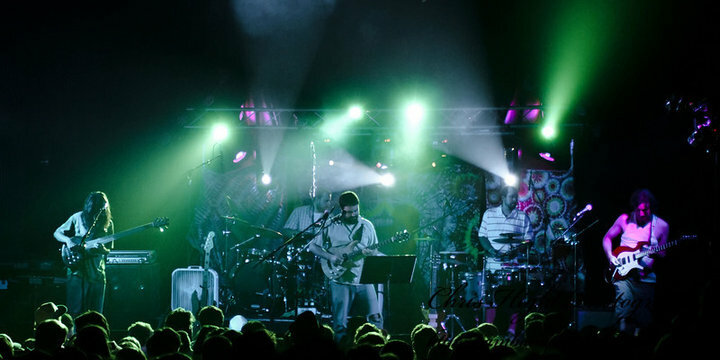 Other notable events on their summer tour schedule will include sets at DelFest in Cumberland, Md., the Telluride Bluegrass Festival in Telluride, Colo., the legendary Red Rocks venue in Morrison, Colo., and the band’s own event, The Festy Experience near Charlottesville, Va. Despite nearly unlimited options, Book said playing at Rooster Walk made sense on a number of levels. RW3 will feature 19 primary bands. The current lineup offers rock, jam, bluegrass, blues, soul, folk, funk, jazz, country and reggae. Rooster Walk will also feature arts, crafts and food vendors from the area, children’s programming, a new workshop stage and on-site camping. Bristol-based roots rockers Folk Soul Revival (FSR), this year’s festival hosts, are the only band scheduled to play both nights of the festival. Other bands performing will include: The Mantras, the Jesse Chong Band, Sanctum Sully, Rob Cheatham & GUNCHUX!, the Lizzy Ross Band, the Kings of Belmont, the Big Fat Gap All-Stars, Jamal Millner & Comrades, Poverty Level with special guest Sammy Shelor, Relacksachian, Travis Elliott, Mariana Bell, the Martinsville Community Jazz Ensemble, Levi’s Gene Pool, Riggs Roberston and the Boys and Girls Club Steel Drum Band. Rooster Walk honors the memory of two young Martinsville natives who passed away in the last four years: Edwin G. Penn IV and Walker E. Shank. Both were graduating members of Martinsville High School’s class of 2000. Proceeds from the volunteer-led festival go to the Penn-Shank Memorial Scholarship Fund at Martinsville High School. In two years, organizers have donated $10,000 to the scholarship fund. Sara Kasey, a current freshman at Randolph College, was the inaugural recipient in 2010. The announcement of the second annual winner is expected in May. General admission tickets for RW3 are currently $40 for a weekend pass and $90 for a VIP weekend pass. Those prices will increase to $50 and $125, respectively, on festival weekend. Tickets are available online or locally at the Southern Virginia Artisan Center in uptown, Binding Time Cafe and Woodall’s Music. For more information, including details on tickets and band biographies, visit www.roosterwalk.com. 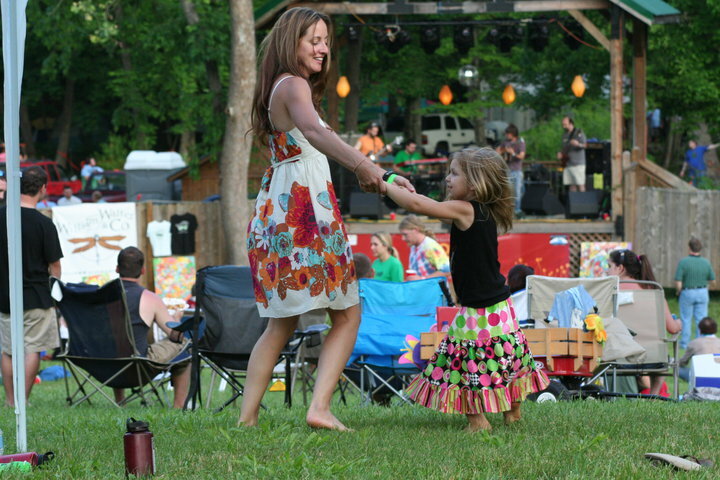 Rooster Walk is a family-friendly festival set for Memorial Day weekend at Blue Mountain Festival Grounds. Last year, 100 percent of all parents survey said they would bring their children back to Rooster Walk 3.